﻿ The Measure of Woman? Beauty is not only in the eye of the beholder but also in the relationship of the eyes and mouth of the beholden. The distance between a woman’s eyes and the distance between her eyes and her mouth are key factors in determining how attractive she is to others, according to new psychology research from the University of California, San Diego and the University of Toronto. Pamela Pallett and Stephen Link of UC San Diego and Kang Lee of the University of Toronto tested the existence of an ideal facial feature arrangement. They successfully identified the optimal relation between the eyes, the mouth and the edge of the face for individual beauty. They discovered two “golden ratios,” one for length and one for width. Female faces were judged more attractive when the vertical distance between their eyes and the mouth was approximately 36 percent of the face’s length, and the horizontal distance between their eyes was approximately 46 percent of the face’s width. Interestingly, these proportions correspond with those of an average face. “People have tried and failed to find these ratios since antiquity. The ancient Greeks found what they believed was a ‘golden ratio’ – also known as ‘phi’ or the ‘divine proportion’ – and used it in their architecture and art. Some even suggest that Leonardo Da Vinci used the golden ratio when painting his ‘Mona Lisa.’ But there was never any proof that the golden ratio was special. As it turns out, it isn’t. Instead of phi, we showed that average distances between the eyes, mouth and face contour form the true golden ratios,” said Pallett, a postdoctoral fellow in psychology at UC San Diego and also an alumna of the department. 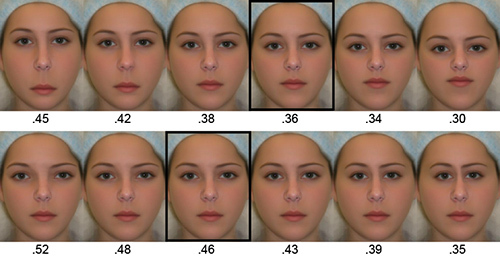 The researchers suggest that the perception of facial attractiveness is a result of a cognitive averaging process by which people take in all the faces they see and average them to get an ideal width ratio and an ideal length ratio. They also posit that “averageness” (like symmetry) is a proxy for health, and that we may be predisposed by biology and evolution to find average faces attractive. The authors note that only Caucasian female faces were studied. Further studies are needed to know whether there is a different set of golden ratios for male faces and for faces from other races or for children’s faces. The research is published by the journal Vision Research and was supported by grants from the National Institutes of Health and the American Psychological Association. Editor’s note: Hi-res imagery and a PDF of the study are available.